Analytical properties of benchtop NMR uniquely suited to drug identification and quantification. How to distinguish related compounds, including isomers, using benchtop NMR. The potential for benchtop NMR to become a standard technique in forensics laboratories. Advances in benchtop NMR spectroscopy overcome many of the limitations of high field by providing a simple to use, portable NMR spectrometer that fits on the laboratory bench. 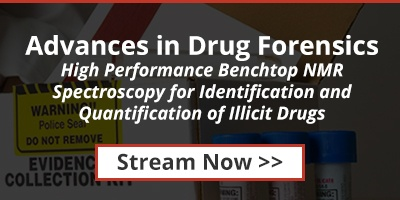 This webinar demonstrates examples where benchtop NMR can be used to distinguish between related compounds, such as isomers, and where other techniques lack the discriminating power or simple sample preparation. We also demonstrate the quantitative capabilities of benchtop NMR with forensics examples.